Banana bread is usually my go-to stress-bake when I’m in such a mood, as I was yesterday evening. This particular recipe I found in the excellent Peyton & Byrne book, gifted to me by a very wonderful friend and it’s so good I barely change a thing (except omit the nuts and maybe add a banana or two, depending on how many I have ripening in my fruit bowl). I admit, I usually only buy bananas just to use in this recipe when they’re nice and ripe – if you leave them too long and they’re practically black, store them in the fridge immediately then use within the week. So if you see me thumping equipment around in the kitchen, don’t talk to me until I’m done or prepare to have a bowl thrown at your head. Recipe adapted slightly from Peyton & Byrne: British Baking. 2. Butter the tin and line the bottom with baking paper. 3. In a medium bowl, sift together the flour, bicarbonate of soda and salt. Set aside. 4. 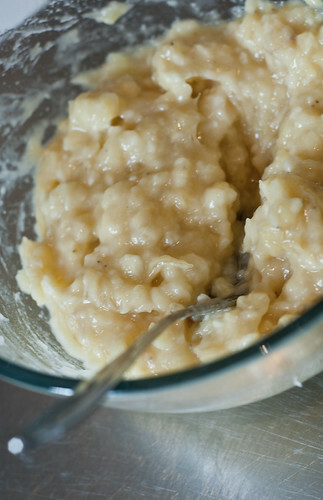 In a small-medium bowl, mash the bananas and set aside. 5. Melt the 125 g butter then pour into a separate bowl, sift in the brown sugar and, using electric beaters, whisk until pale and fluffy. Add the eggs one at a time, mixing well after each addition. 6. Add the mashed bananas, buttermilk and vanilla and mix well with a spatula. 7. Sift in the flour mixture and fold in until just combined – do not overmix. Pour into the prepared tin and sprinkle with the caster sugar. 8. 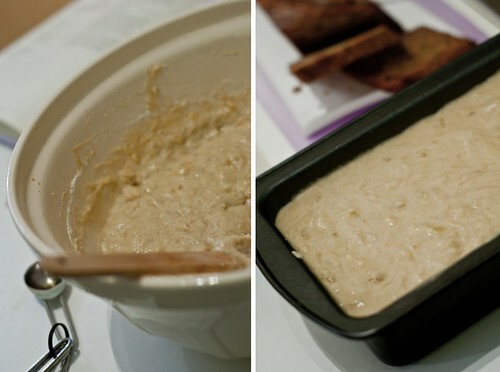 Bake for 35-45 mins or until the loaf springs back to the touch and a skewer inserted into the centre comes out clean. Remove from the oven and leave to cool in the tin for 5-10 mins before turning out onto a wire rack to cool completely. Will keep for 3-5 days in an airtight tin. 9. Enjoy with a cup of tea and feel the stress easing away. This looks delicious!!! Banana bread is definitely one of my weaknesses…so much so I’ve created a low fat version so I can eat it every day haha! Ohh, I know those moods well. 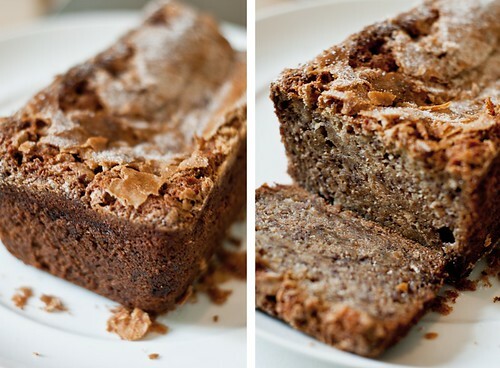 And you’re right; banana bread is JUST the ticket. It’s comforting to make and to eat loads of (with lots of butter, please). I’m hoping this black cloud mood has nothing to do with your health. Hopefully it has passed and that baking and eating this banana bread helped a little. It looks so lovely and rustic. Cooking and baking are my ways of relieving stress. Hopefully the dark skies are no longer around and you’re experiencing nothing but sunshine. :) That’s a wicked-looking banana bread (especially that lovely top)! I’ll give it a try as soon as I get my act together and buy a kitchen scale. How perfect that I’m reading this post tonight…I’m in such a black cloud, and I can completely relate to what you wrote. This banana bread look so yummy though. Maybe this is what I should do…bake. Thanks lovely. Hugs.